Think sludge metal and no doubt your mind will wander to someplace, like, perhaps New Orleans, birthplace of countless bands that are iconic, in fact defining, of this particular sound. This is unless you are familiar with Iron Monkey, in which case you will instead find your mind’s eye flooded with images of the sunny vistas of Nottingham, and the glorious East Midlands. Before heart failure tragically claimed the life of their infernally excruciating squawker, Johnny Morrow, in 2002, two albums were released, the most iconic being this one, right here. The lurid cover art gives you a good idea of what to expect from the album; low budget, bowel-scraping rock noise. Back to the NOLA references: Iron Monkey are less technical and adventurous than Soilent Green, and less ponderously metallic than Crowbar. What they are, however, is almost the British Eyehategod. The two bands are similar in many respects, from the pained, straining vocal delivery to the slow, but rough and ready riffing, which sounds like a garage blues-rock band wading through tar. There are very significant differences as well. 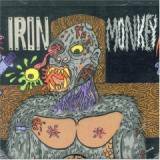 Iron Monkey is more immediately catchy and less despairing. Way more fun, in fact, even if less deep. Closer to home would be a band like Charger, with whom they also have a great many things in common, although Monkey are generally bluesier and swing more. You could not possibly wish for a better opening than the awesome Bad Year. We start, of course, with obnoxious feedback noise, which is promptly trampled under the feet of one of history’s most crushing riffs. Mid tempo and almost moronically simple rhythmically, the glory of this lies in its “what more do you want, Professor Genius?” simplicity. The band spends far more time playing only one note than is generally advisable, and thus achieve greatness in the most direct possible way. It’s stupendously catchy, in the same way as getting a fishing hook through your eyelid is catchy. A little bit painful, but certainly memorable. Then you get to Supagorgonizer, with its energetic up-and-down-a-blues-scale riffing lightening the sonic load considerably, being practically party music in a way you would never, ever hear from any of the other bands mentioned above. The same could be said of Boss Keloid; music to drive fast and crash a lorry to. And thus it continues: typically, songs follow the model of infectious main riffs, which twist their way into slower, more oppressive sections, before finding their way out again. Whilst the former are the highpoints, and what make this album so worth hearing, the latter are essential as a means of making the whole thing nastier and more… sludgy. The exception is the hidden track at the end which strides into dark and ugly drone territory, with the album drawing on a Khanate kind of shape just in time to die (the song also cunningly references the cough from the beginning of Black Sabbath’s Sweet Leaf). This is a great album by a much-loved and sadly-missed band. It is essential listening for sludge fans.